For many years it was illegal to buy gold or silver in the United States except in specific forms such as jewelry. 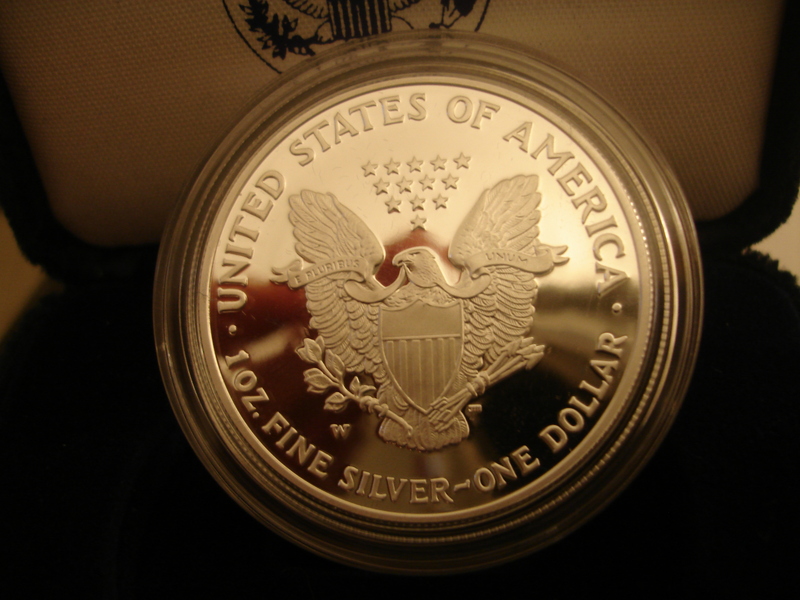 Gold and silver bullion was tied to the money supply and the government attempted to set its price to the dollar. 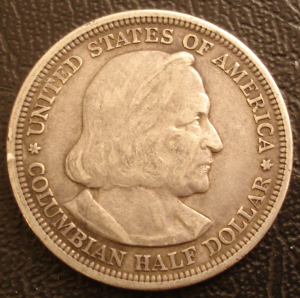 In fact, in 1933 to encoruage fiat paper money FDR legally ended gold ownership. 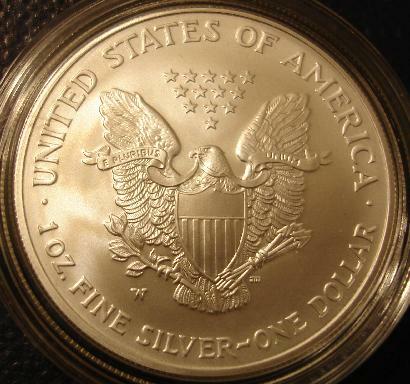 Gold and silver bullion continued to be restricted until 1975 when gold and silver ownership was finally deregulated. 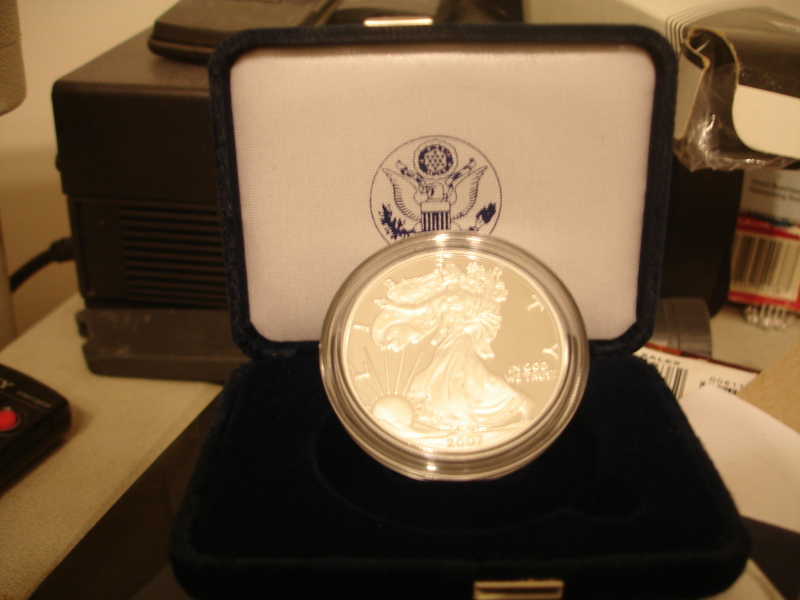 Ronald Reagan further encouraged gold and silver bullion releasing new American Gold and Silver designs which competed with the widely popular South African Krugerrand for Gold and Silver investors. The result of the American Effort was that in 1986, the first US gold and Silver Eagles became available since 1933. 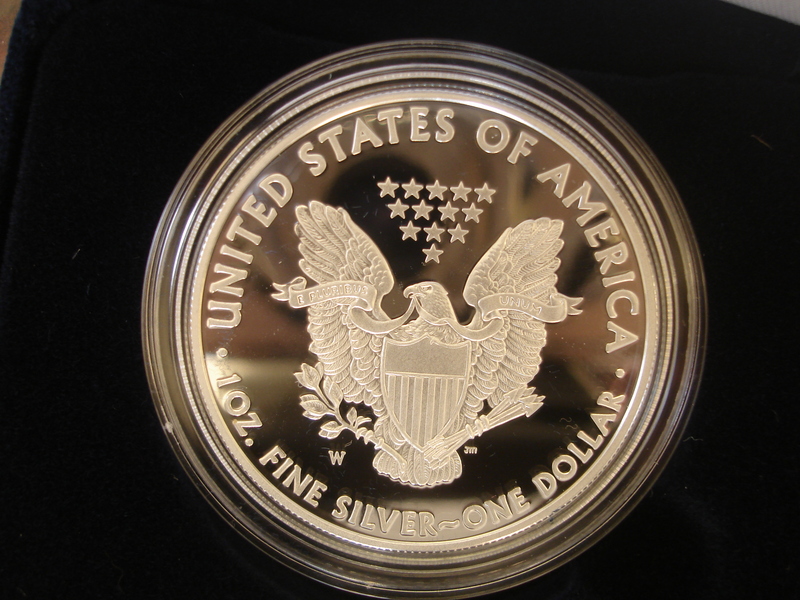 Unlike previously minted gold and silver coins, these coins have never been intended to be circulated, but rather sold above face value for spot price of gold and silver through a network of dealers who then made them available to the public. 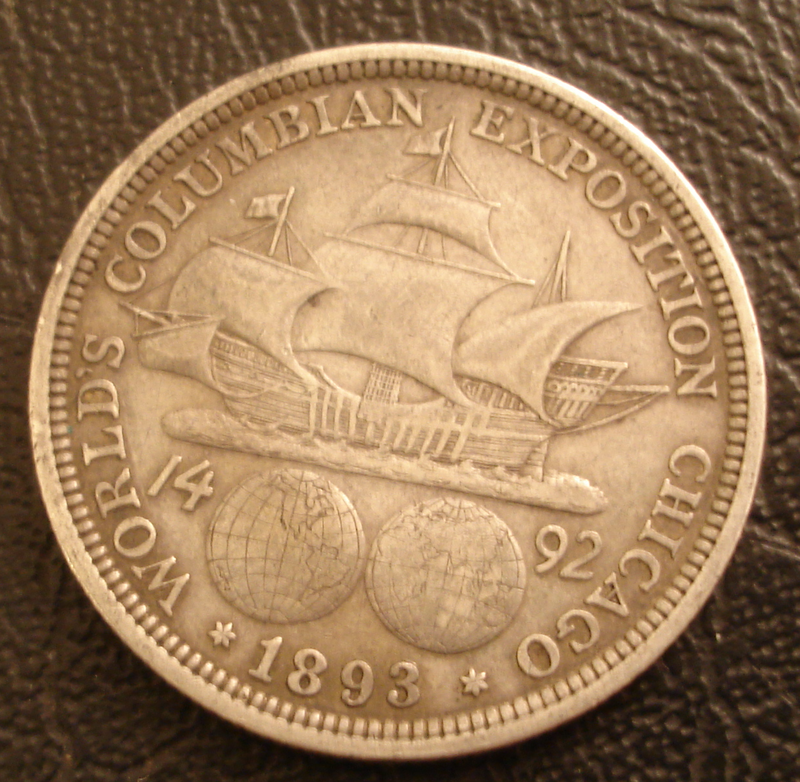 The basic American Designs used two classic previous designs. 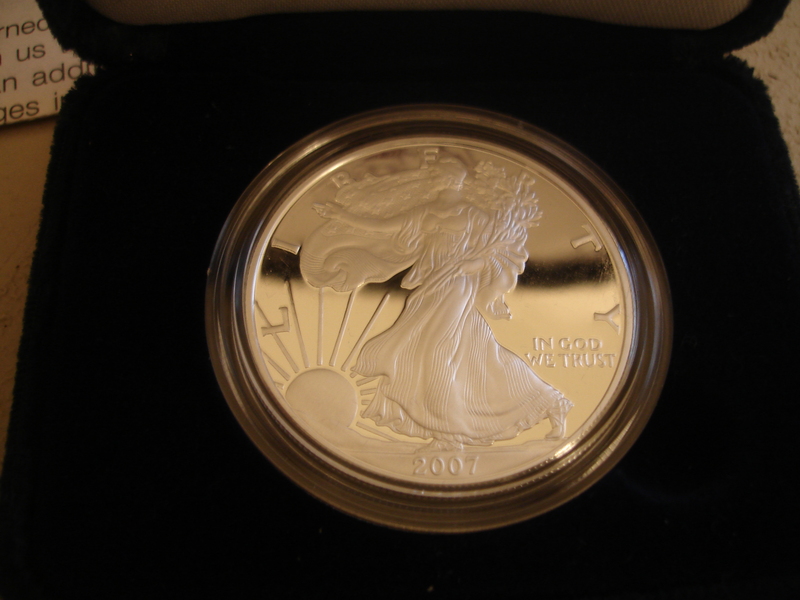 The gold coins used the Walking Liberty Motif created by St Gauden's Double Eagle design. 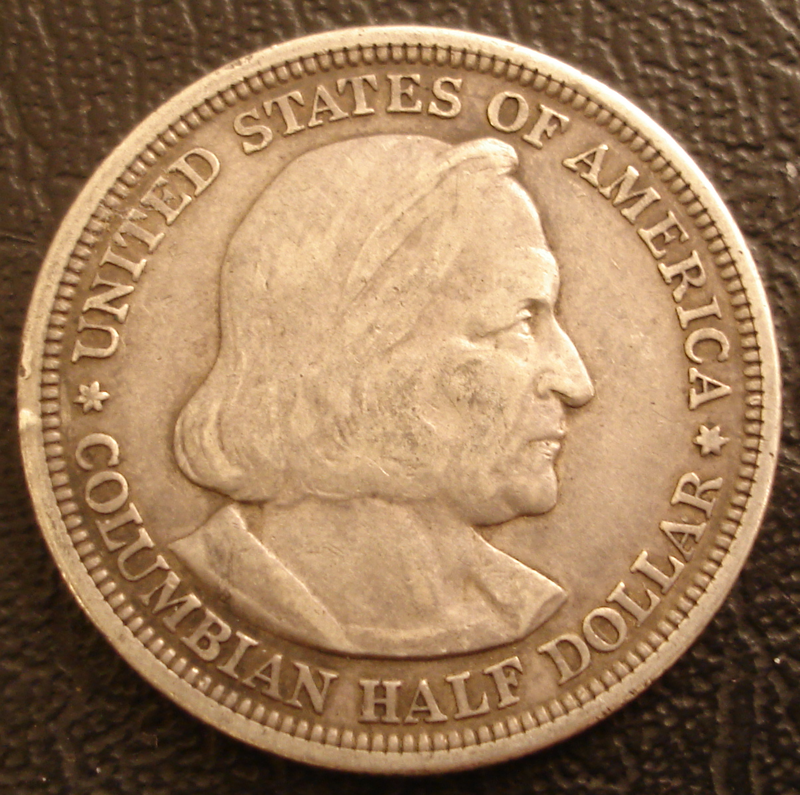 The Silver Eagles borrowed the Walking Liberty Half Dollar Design by Alfred A Weinman. 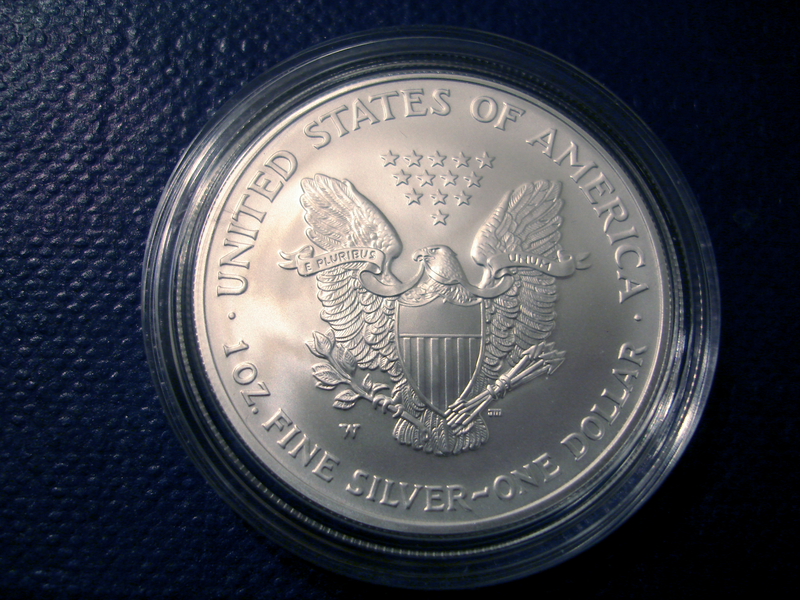 The resulting Silver Eagles are some of the greatest coins the US Mint has ever produced. 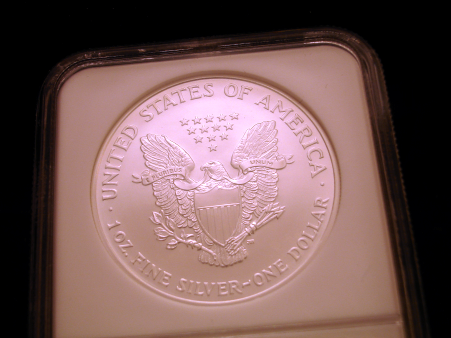 The mint has used modern minting and design techniques to make a nearly perfect design on the proof and uncirculated coins. 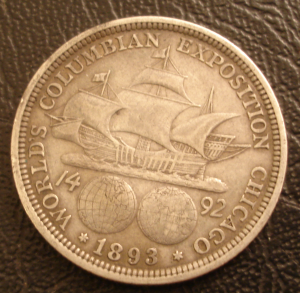 And the coin itself continues to be more and more popular with the general public. 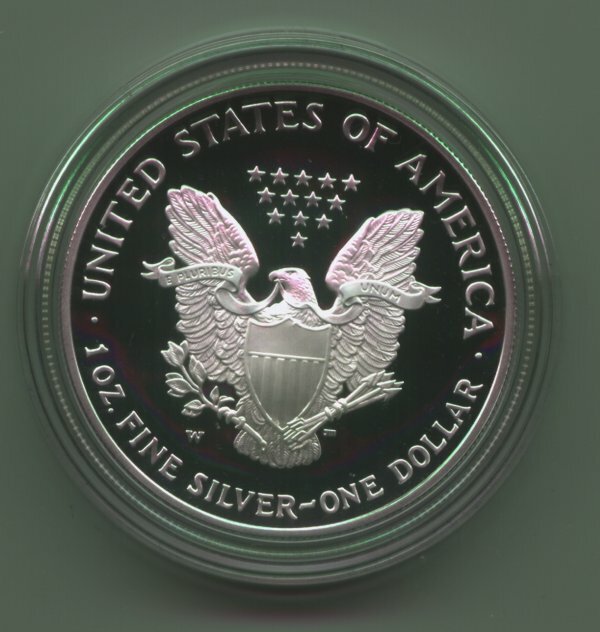 This is a scan of a 2005 American Silver Eagle Proof coin which is a fine example of what these coins look like in the modern design. The delicate fingers in the raised left hand are gracefully carved while the sun and rays have full body. The whole composion is the complete potention of the original Weinman design. 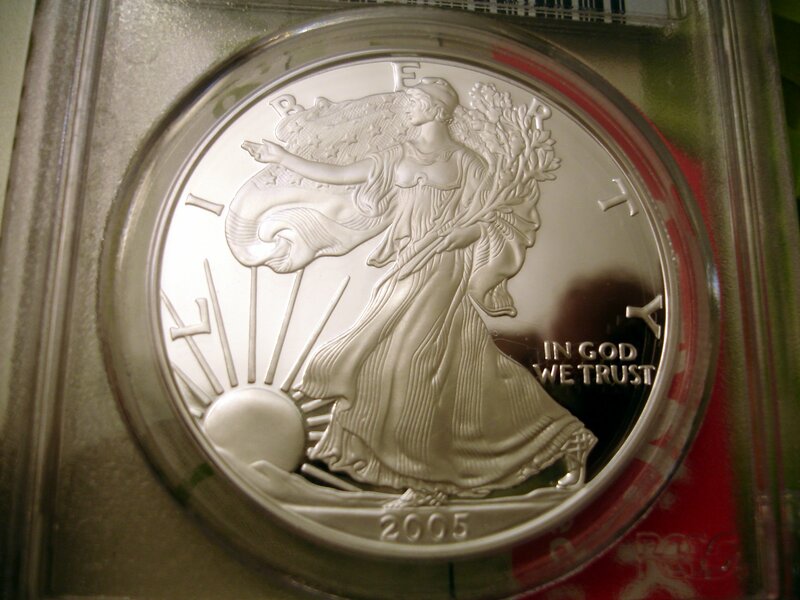 Here is an example of the popular a 2006 uncirculated W which we got from the mint. 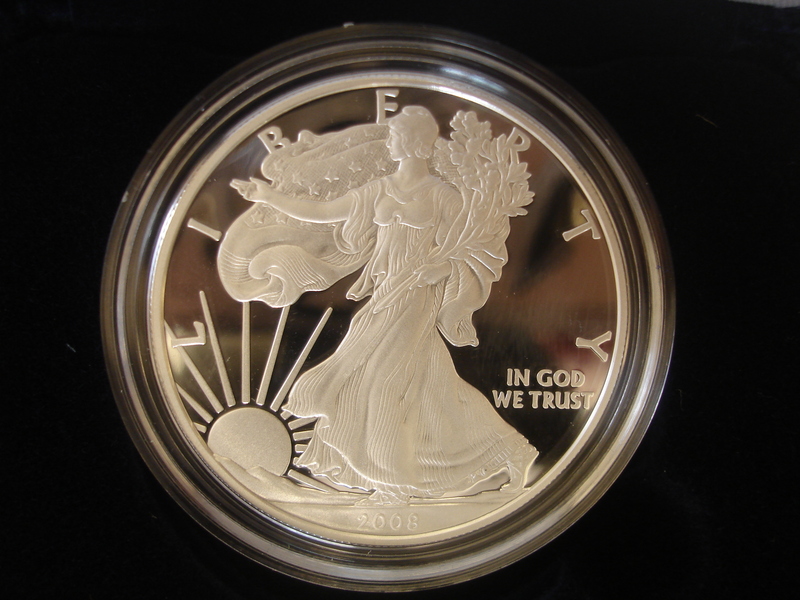 Sometimes the uncirculated coins can have more detail than proofs because the polishing methods and satin finishes can remove subtle details. 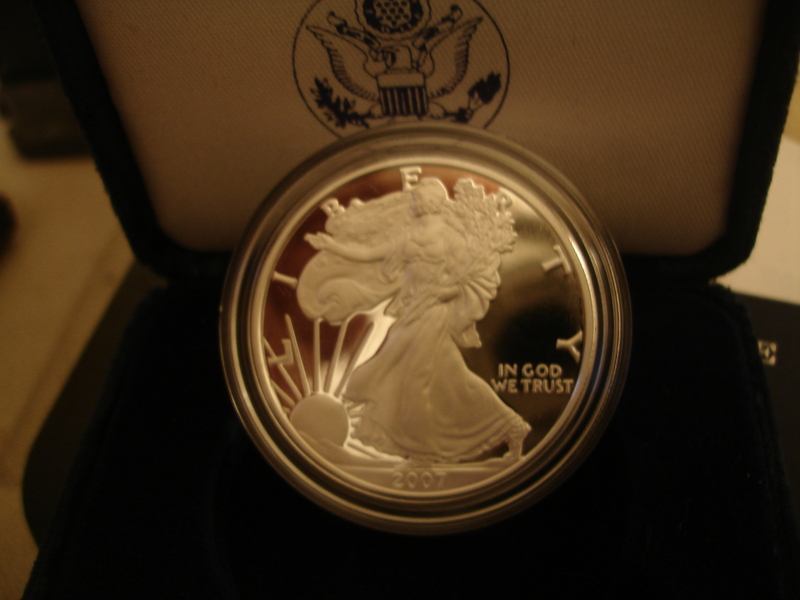 This coin was part of the 20th anniversity ASE series by the US Mint. 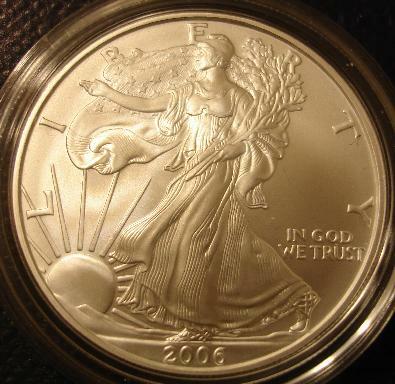 Here is an example of that 2006 uncirculated without the W mint mark. 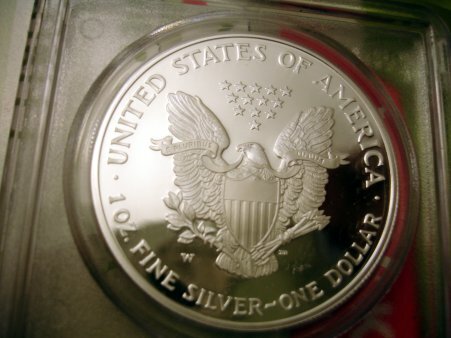 Those without the W are sold in bulk to dealers for distribution, mostly as silver assets. 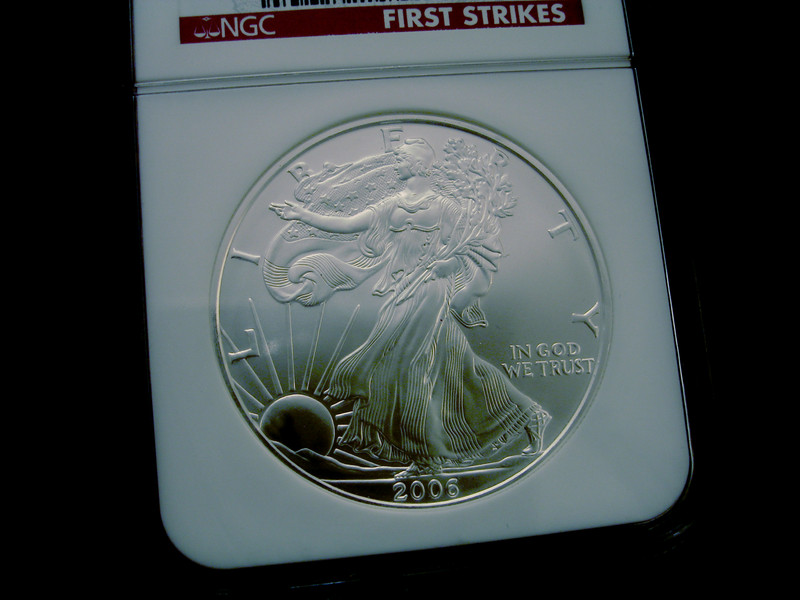 This one is a "First Strike" NCG slab. The first strike demarcation which all but means nothing. 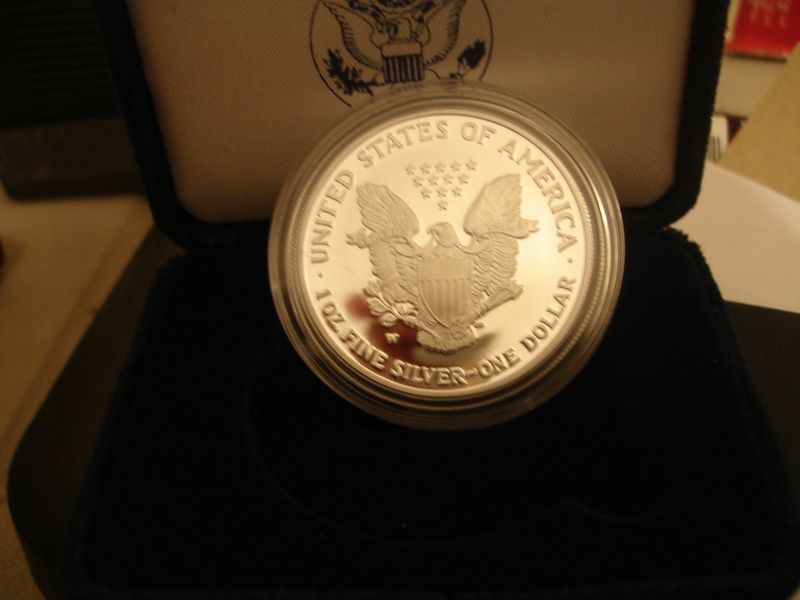 However the coin is nice, although it suffers a mark on the neck making me refer to it as our murdered liberty. 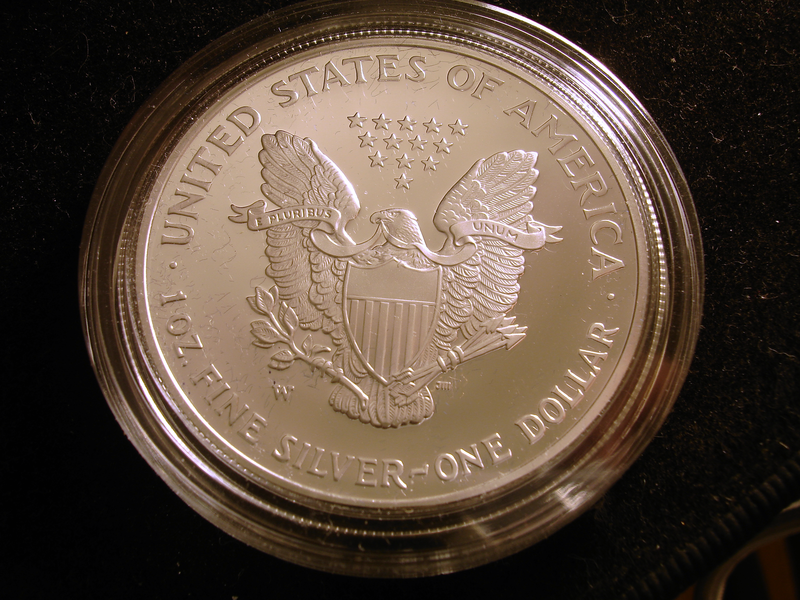 This is one of the 2005 proof American Silver Eagles, but this time as a photograph instead of the scanner derived composition. 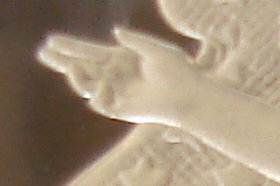 The detail of the camera's image now outstrip those of my old HP scanner. 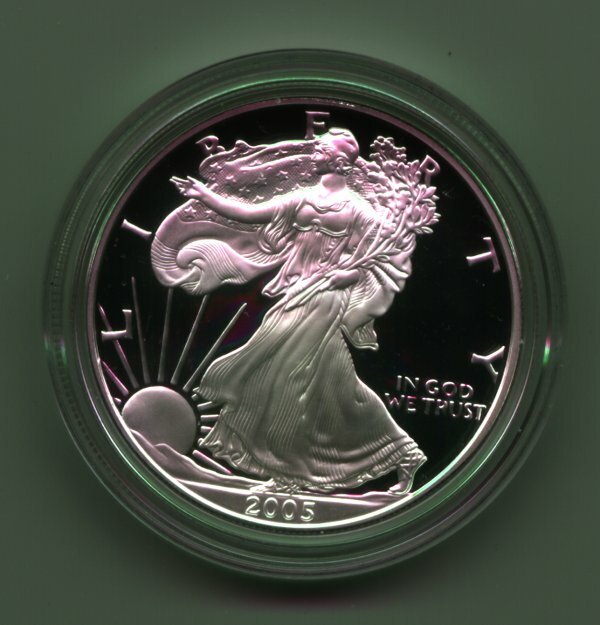 This coin is a PR69DCAM graded 2005 Eagle slabbed by PCGS. 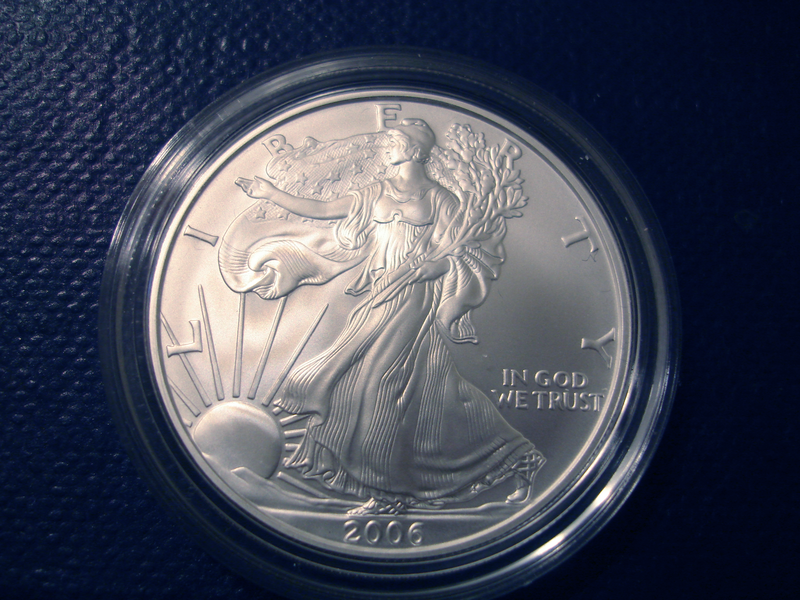 These are some photographs of the 2007 edition. 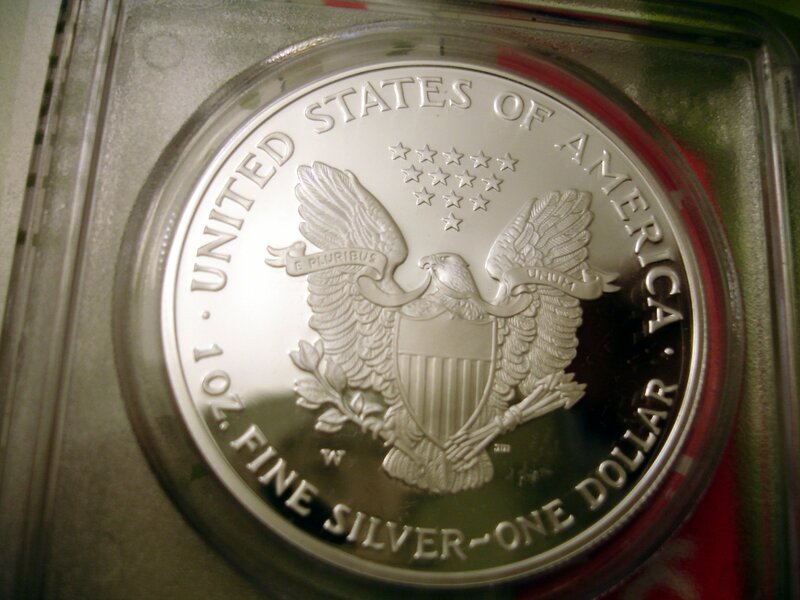 It seems that a clear leap has been made by the mint in this year in the minting of these coins as nearly every 2007 Proof Silver Eagle that I've seen is nearly spotless and strong in strike. It makes me wonder if they still use dyes. The right hand feels like it now jumps off the face of the coin. 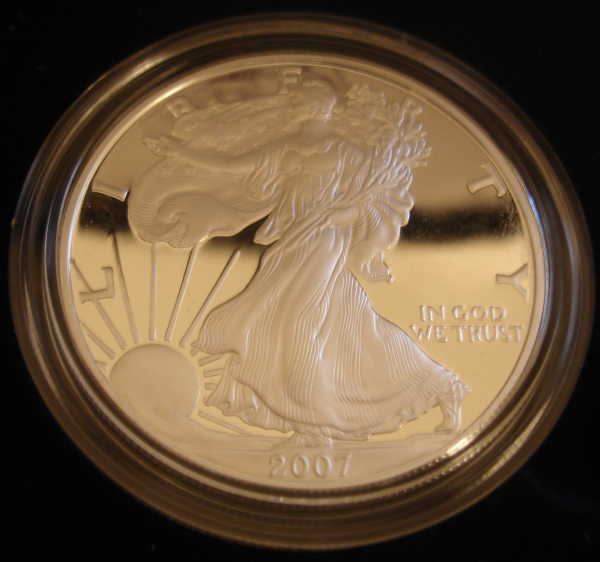 With every passing year the US Mint improves it's minting process. 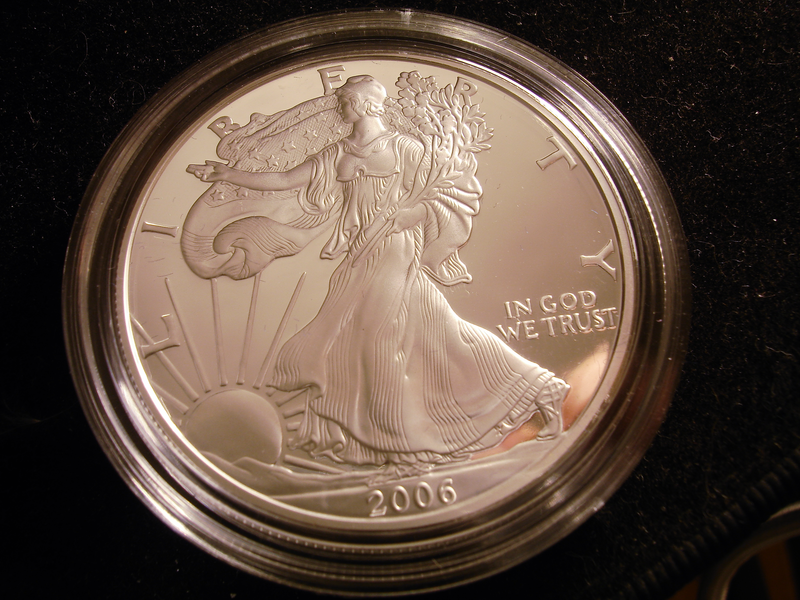 In 2008 the American Silver Eagle Proof took a quantum improvment in the details of the coinage. Look at these 2008 Proof examples.